…and at last s is for the summer too. Hot, sunny days without a cloud in the sky so of course s is also for swimming. We have returned recently to one of our favourite spots and, because it’s September, we had the place mostly to ourselves. We took our friend Ana-Louisa with us plus a picnic. The water was bitterly cold at the start but this didn’t bother the dog who thought she had gone to heaven. S is also for seedlings. There’s plenty to be done in the veg patch as the second round of crops are sown; so far cabbage, calabrese, cauliflower, chard, sweet peas and broad beans have all germinated. I need to get rid of the pesky mouse that’s making holes in the beds before I plant them though. Meanwhile the courgettes are just about still going, the tomatoes too, and we have peppers and aubergines ready. Yesterday we had the last of our potatoes though (how I hate having to buy them now!) but the first of our leeks which made up for that, they’re great this year. Finally, S is for Spain as we plan another camping trip this time a couple of days in Salamanca. Super! We’ve been so busy this week we haven’t had time to put up an anniversary blog entry. We flew into Portugal on September 11, 2009 (an easy date to remember) to begin our new life and here we are a year later in our wonderful home. The reason for the lack of postings? Well, we’ve been enjoying ourselves! We’ve had my sister, Sue and brother-in-law, Kevin over to stay. While they were here we swam in the sea at Figueira da Foz and in the river at Zezere and went for walks in the countryside including one with a new bunch of Portugal friends near the beautiful village of Dornes. We also returned to the ancient town and castle at Tomar. 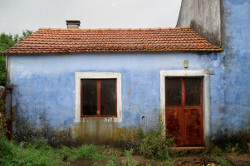 I usually keep these non Casa Azul activities to my regular Portugal blog but I thought I’d slip these photos in here anyway. All this of course doesn’t stop activity in the garden and kitchen and Jackie has been as busy as ever tart making. Although our tiny fig tree is not yet ready to start producing there are loads of fig trees near our house to plunder and right now they are all in fruit. Here is a delicious fig tart Jackie made recently. She has also been making Courgette cakes which are the business. When she is next out of the kitchen, I’ll make sure she puts finger to keyboard and gets the recipe on our recipe page. Other news: Well the hot chillies are finally going red as are the sweet peppers. We will have a final flush of tomatoes before they finish and sadly we have had our last fresh cucumber (pickled ones will be ready soon). But as we have now been here for a year we can look forward to the crops we first harvested last year – the walnuts will soon be ready and then we are into the olive harvest. Can’t wait!